Very quickly blanch peas in boiling water - not enough to cook them, but just a bit more than to thaw them. Shock the peas in ice water. Add the peas to a blender with 2ml cold water and purée until smooth. Pass through a fine strainer. Bloom the gelatin in 20ml of boiling water until fully dissolved. Cool it down a bit and then stir it into the pea mixture. Pour onto a flat tray and refrigerate until set. Cut into 3cm diameter circles and place each circle on a serving dish. Cook chanterelles on medium high heat with olive oil and sea salt until cooked through. Place each mushroom on each of the 6 pea gelée circles. Clean and slice the red radishes into 6 equal pieces and place each slice next to each chanterelle. Place one snow pea flower next to each radish slice and cooked chanterelle on top of each circle of pea gelée. Drizzle a bit of olive oil on top of each and sprinkle a bit of sea salt and serve. 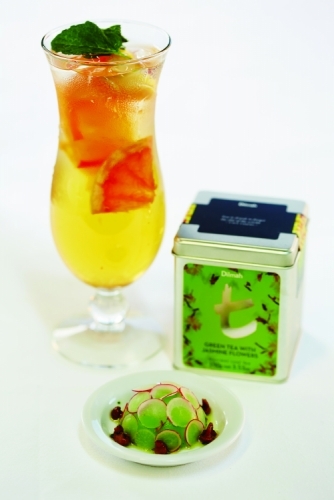 Built drink, non-alcoholic tea-based drink made with Dilmah Green Tea with Jasmine Flowers, Elder Flower Cordial and Fresh Seasonal Fruit.